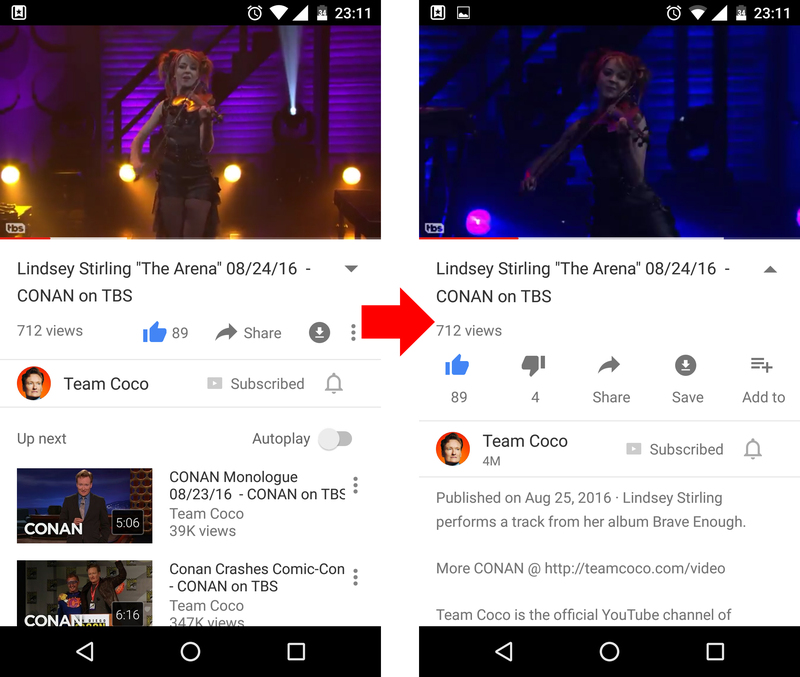 It would appear that Google is rolling out yet another tweak to the YouTube app's interface. This time, there's a new layout and a slick animation when you expand the video description. This is also where you'll find most of the video actions now. You can see above the two states of the new UI. On the left, everything is collapsed (note, the thumbs down button isn't shown by default here). Tap the down arrow there, and the description expands along with larger buttons for thumbs up/down, share, save, and add to list. It slides open with a really nice animation that's reminiscent of the quick settings in Nougat. The video option overflow button in the new UI may also be down by the action buttons rather than on the video. We can't be certain this is the same button, though. You can see it all in action below. As with most of Google's YouTube changes, this one appears to be a server-side switch. We've gotten a few tips about the new UI, so it appears to be rolling out. You'll probably get it sooner or later.